Incredible BEACHFRONT views from this renovated 4 bedroom, 4 bath South Beach townhouse! Located on the first floor is the updated kitchen with granite counter tops and stainless steel appliances. The dining area is adjacent to both the living area and kitchen has a large table with seating for up to 8 people. Next to the dining area is a cozy glassed in Carolina Room with a large sofa and comfortable chair. This is a perfect spot to take in the beautiful views that abound from this villa! 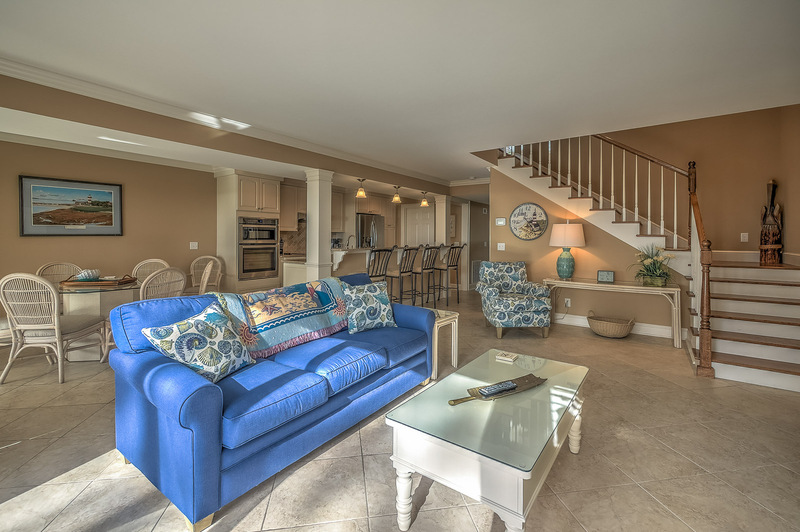 The living area has plenty of seating for everyone in the family! Access your private deck from the living room. The deck offers wonderful views of the Calibogue Sound as well as a gas grill for cooking the perfect steak! Also on this level is a bedroom with 2 twin beds and a full bathroom. Upstairs on the 2nd floor are 3 more bedrooms. To the right of the top of the stairs is a bedroom with a king bed and a private bath. Down the hall is the master suite with king bedding and en-suite bath with double granite vanities and shower/tub combo. This bedroom also has a private deck for you to enjoy the views of the Sound while drinking your morning coffee. Next to the master suite you will find a bedroom with queen bedding and a private bath. The stunning views and all the amenities of South Beach makes this the perfect place to vacation. Just a short walk to the South Beach Marina pool, racquet club, shops, restaurants, and water sports. 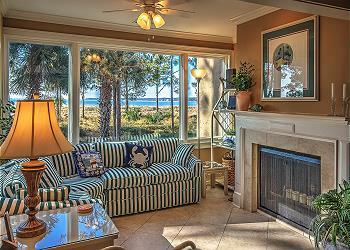 This is the best beachfront value in Sea Pines. •	The Vacation Company App will contain all of your check in information (keyless door code, Wi-Fi Codes and other pertinent information about your rental property).